A homeless person’s pet is often their only companion and sometimes even their reason for living. 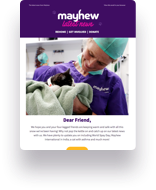 Mayhew works closely with several organisations like Crisis who offer support to homeless people in London. This gift could provide a free general health check for the animal of a homeless person, administer flea and worming treatments and micro-chipping as well as collars with tags, leads, and coats to help keep their dogs warm in the colder months.